Synopsis: Having come out of hiding to claim the throne of Asgard, Hela the Goddess of Death seeks to rule Asgard. Having been cast aside on a distant planet, Thor must use his strength and an old friend to help him reclaim Asgard’s throne, and prevent Ragnarok, the end of all things, from occurring. Review: Of all the directors Marvel could have hired to take on a film that studio head honcho Kevin Feige described as “very important movie in our timeline”, one of the most out of the blue choices you could suggest would be New Zealand native Taika Waititi. Having made his name with the very quirky comedies such as What We Do in The Shadows, and last year’s hilarious Hunt for the Wilderpeople. Yet, having seen humour become an important aspect of their films, Waititi seems to be the perfect match for Marvel, and as it turns out, it is absolutely a match made in Valhalla. For a film subtitled Ragnarok, meaning the end of everything, to be pitched as a quirky comedy masquerading as a big budget superhero blockbuster, could have been a spectacular misfire, but in the hands of Waititi it is all just blends together beautifully. On a quest to find out some information is where we meet the God of Thunder, and he quickly learns that The Goddess of Death Hela has come back to Asgard to take her place on the throne, setting off a chain of events that sees Thor trying to unseat the Usurper whilst preventing Ragnarok from occurring. Though not written by him, the script has that Waititi stamp written all over it. There are gags aplenty, and they’re almost always hilarious. It’s a bold claim, but this might just be the funniest Marvel film to date. Hemsworth and Hiddleston are once again just delightful to watch in these roles that they have made their own, with it also being great to see Mark Ruffalo and the Hulk in all of his green, raging glory back in the MCU once more. There are quite a few new faces here, the absolute standouts being Tessa Thompson’s badass Valkyrie and an absolutely uproarious star turn from Waititi himself in a role that will have you almost crying tears of laughter. It is absolute comic gold and a character one would hope gets his own movie somewhere down the line. Meanwhile, Jeff Goldblum is inevitably always a pleasure to watch, and as the Grandmaster, it feels like a role that was just written for the Goldblum and he like the Odinson brothers, he bosses it. A real consistent Achilles Heel for the MCU has been their villains, as the last Thor film testified. Thankfully, Cate Blanchett as Hela is able to avoid falling into the realm of bland and generic villains that have troubled MCU films gone by. She is well fleshed out as a character and it makes her story so much more compelling to watch. The same unfortunately cannot be said for Karl Urban’s character who does sadly fall into that category of villains that are just kind of forgettable. Whilst also perhaps boasting the most vivid colour palette that the MCU has seen to date, when the action goes down Waititi’s direction is confident and assured. 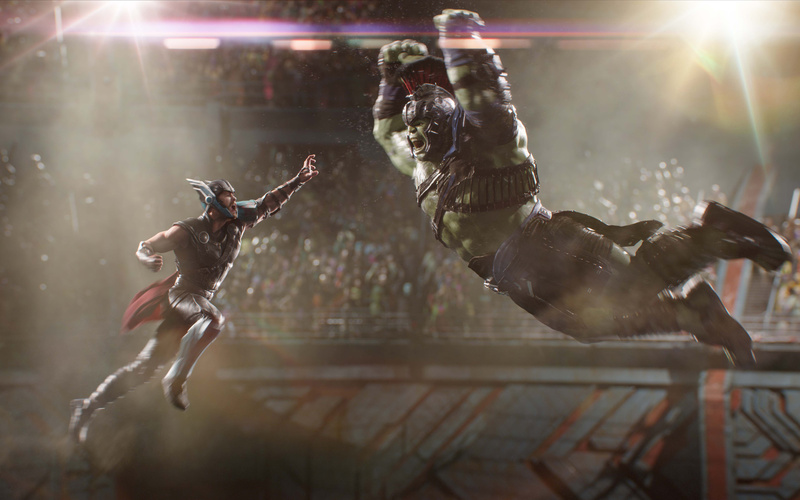 The battle between Hulk and Thor that we saw a glimpse of in the trailer is just spectacular stuff, you cannot beat a bit of intergalactic gladiatorial duelling can you? With the help of some Led Zepplin, the final showdown is also breathless to watch. The whole thing might seem absolutely bonkers and absurd, but it all blends together into some delightfully, colourful and exhilarating entertainment. With complaints of superhero fatigue coming from some audiences, this is the shot in the arm that the genre needed to help keep things fresh. It’s so different in terms of style and everything that it is certainly a most welcome breath of fresh air for the genre. With them now a staggering 17 films deep into their universe, Marvel are showing no signs of slowing down, and when they’re continuing to produce such glorious excitement, who in their right mind would want them to stop? 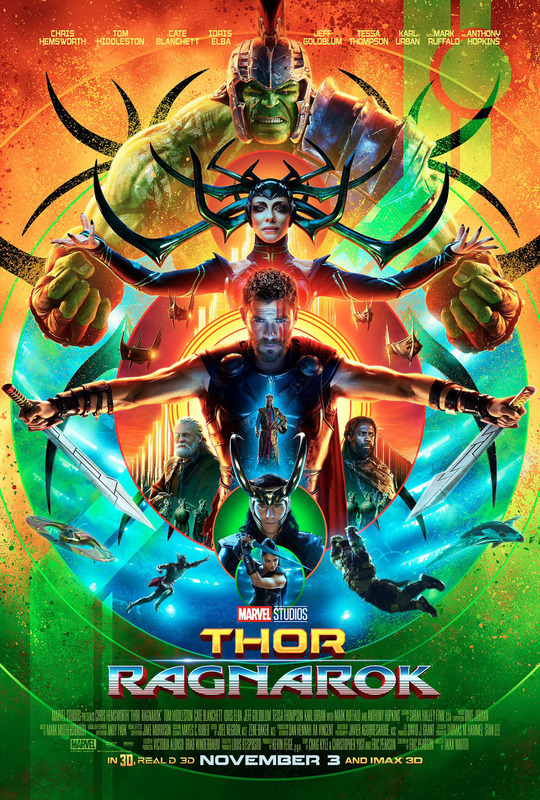 Fusing a deeply personal story with some absolutely first class humour that will have your sides hurting, Waititi brings his vibrant style of quirky comedy to the MCU, and it pays off big time. The best MCU film of the year.